Drawing Files: I am providing these files for convenience only. They are exports from Vcarve Pro. In addition to the tools, you will need a 5" x 5.5" x 1/2" piece of aluminum stock, like the one shown here. You will also need to print the Z-Plate template. Once printed cut out the template. The stock can be purchased from online metals, but I will also provide a piece of stock that will have better cuts. Use blue painters tape, and attach the template to the stock as shown here. The actual placement of the template on the stock has a lot of latitude. It's the relationship of the actual holes to one-another that is important. With an auto-punch, mark each hole location. Using a 7/64" drill bit, drill a pilot hole in each of the marks you just made. The stock with the 14 pilot holes should look like the one shown here. 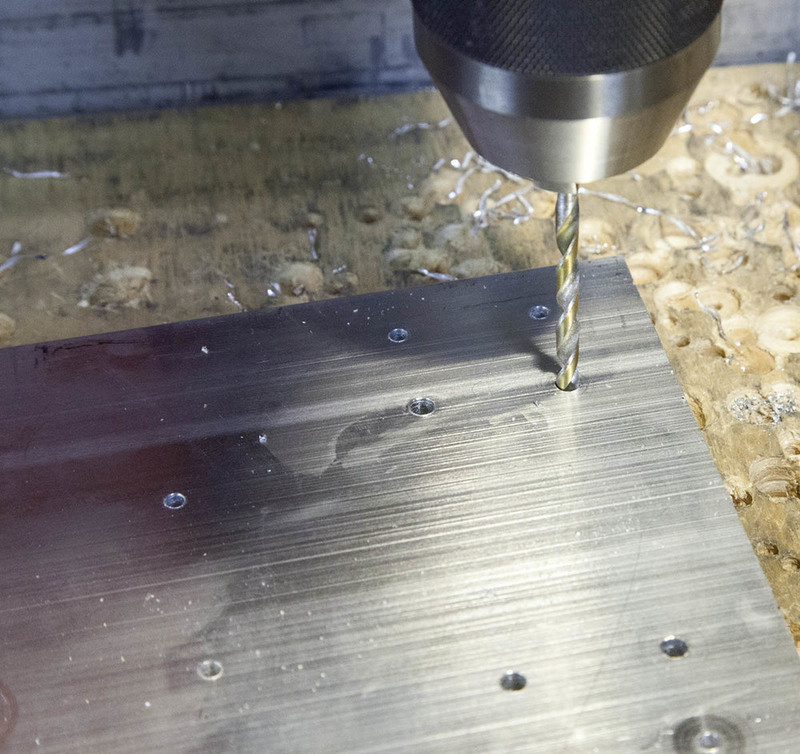 Using a 5/32" drill bit, enlarge the four holes marked with 5/32" on the template. Later these holes will be tapped with a 10-32 tap. Using a 7/32" drill bit, enlarge the holes marked 7/32". Also enlarge the holes marked 3/8". Enlarging the 3/8” marked holes will make them easier to drill later. Using a 3/8" drill bit, enlarge the holes marked 3/8"
Once all the holes are drill counter sink the holes slightly with a larger drill bit. Here I am using a 5/8" drill bit to do this. Be sure to hit both sides of the hole. It is recommended that this step is done on the 3/8" holes to keep the shoulders on the mounting screws from hitting the plate when in stalled. The other holes are optional. Use a metal file to clean the cut edges of the stock. This is an optional step. Use a 10-32 tap to tap the four holes marked 5/32"
When tapping holes be very careful, as a broken tap will ruin the part. Use oil when tapping, and withdraw every turn or so to remove debris. 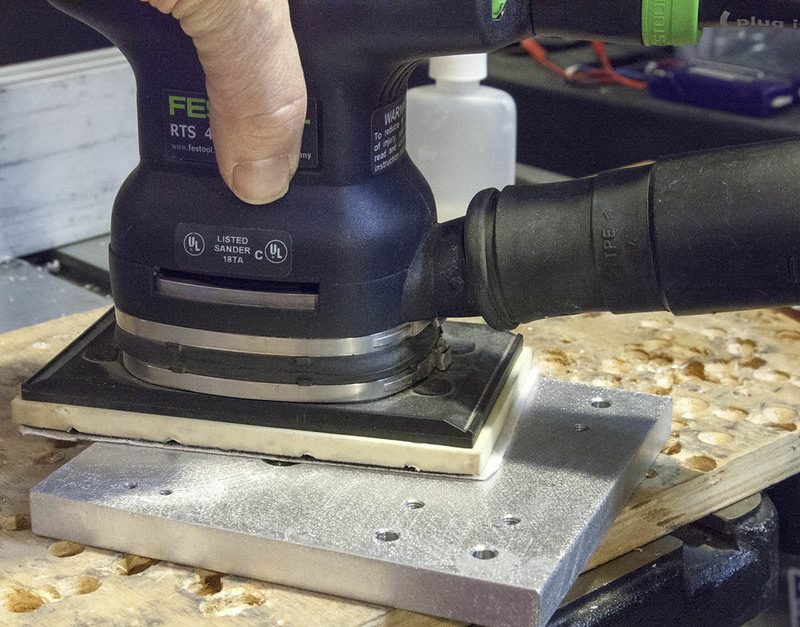 Use a 6-32 tap to tap the two holes marked 7/64"
To create a brushed finish, hit all sides of the completed part with an orbital sander and 200 grit paper. This step is completely optional. This completes the Z-plate. Follow the instructions in the KRMx02 workbook for installation.